Interstate Highways. All interstate highways shall have continuous fencing on either the right of way line or at or near the access control line except in areas of precipitous slopes or natural barriers, or where it can be established that such fencing is not necessary to effectively preserve access control. Agricultural Areas. Fencing may be provided in intensive agricultural areas where cropping on the right of way is likely to occur or where cultivating methods result in conditions requiring extra or more extensive maintenance operations than normal. Drive Gates. Drive gates may be provided at selected locations to assist maintenance operations. Drive gates may also be required at locations involving certain utilities. The use of drive gates is to be held to a minimum. 1. If curved top fencing is not well received due to aesthetic concerns or a perceived negative impression by members of the public, vertical fence taller than the standard 6 ft. fence can also be considered. 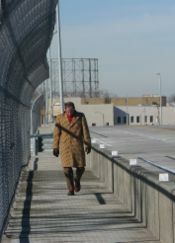 However, taller vertical fencing is not to interfere with the future safety inspections of the bridge. 2. 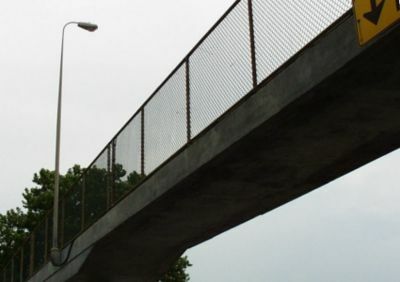 Existing grade separation bridges with sidewalks, but without fencing within the project limits, are to be considered for retrofitting with a fence. A design exception is needed if upgrading to a standard fence is not possible (for example, if sight distance will be compromised). 3. Existing grade separation bridges not having sidewalks within the project limits that carry appreciable pedestrian traffic are to be considered for retrofitting with fencing. A vertical fence can be considered for situations where a curved top fence overhang may create horizontal clearance problems. 4. The current 2 in. x 2 in. mesh opening size for chain link fence fabric is to be the maximum mesh size to provide effective screening for aesthetic fences. The screening details are to be so that debris cannot be easily pushed under the fence onto the roadway below. 5. Consider security fencing where potential exists for unauthorized people to gain access to the bridge's substructure or superstructure. 6. Fencing is to be placed so that it does not interfere with the sight distance of approaching vehicles from the mainline or side streets. This page was last modified on 7 April 2017, at 14:16.